Last week I told you I would be attending the last IDEAPartnership meeting! As I write this week's article, I am still in Alexandria, Virginia, having just finished the meeting this afternoon. The meeting had nineteen (19) national associations, eleven (11) different states, thirteen (13) different Technical Assistance centers, nine (9) Parent Centers, three (3) federal partners, five (5) guests, two (2) local advocates, and of course the IDEAPartnership staff! It was a ballroom full and a VERY cross stakeholder group! The partnership grant was not funded again for this cycle nor were the regional resource systems. Instead a new grant was established as I explained in "Part 1" last week. However, the new National Center of Systemic Improvement has adopted the Leading By Convening framework for their model for cross stakeholder engagement and NASDSE is one of the major partners in the leadership team of the NCSI. As usual, this was a great and productive meeting. It had just the right mix of celebration on the accomplishments, work on developing tools for today, as well as looking forward to an even great impact on improving student achievement! The meeting started with a Retrospective time on Tuesday evening with Renee Bradly, OSEP, giving a great reflection on the work and the accomplishments. On Wednesday morning, Larry Wexler, OSEP, and Co-Director of NCSI, Kristen Reedy, gave remarks and the work began! The meeting ended with remarks from OSEP director, Dr. Melody Musgrove and Co-Director of the NCSI, Rory Fitzpatrick. Throughout the 2 days, there was a mix between whole group and small group work. If you haven’t seen the great resources of the Leading by Convening and the "Collections," you need to check them out! If you are interested in learning how Leading by Convening compliments RDA, then you need to register for the 4th Annual CASE Hybrid conference where the second day is all about RDA and Leading by Convening — Click here for the Schedule-in Eastern Time, click here for a flyer and click here to register! See the article below for more information. Last week's poll was about professional learning! 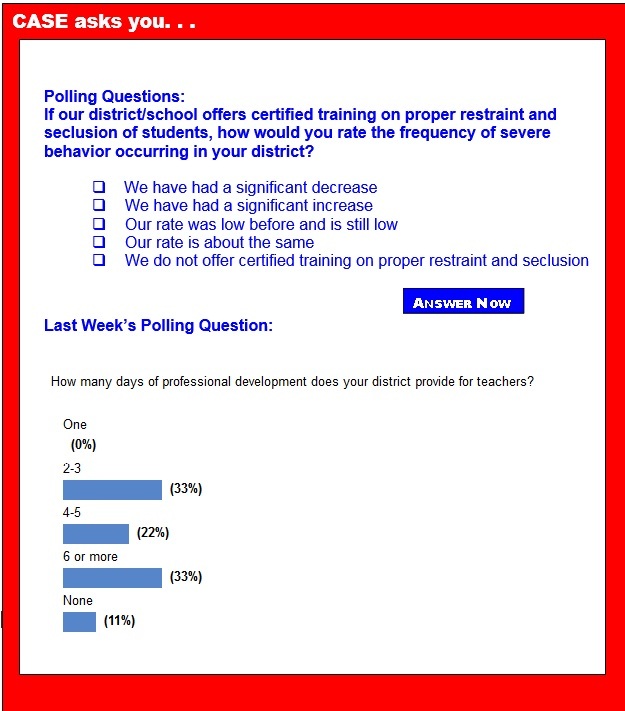 This past week the poll question was, "How many days of professional learning does your district have for teachers." There was a tie for the number one answer of how many PL days are given to teachers — 33 percent. Only 2 percent had 2-4 days and 11 percent had none! Perhaps, the 4th Annual Hybrid is just what the "doctor" ordered! There is still time to register for either the onsite or the virtual! We should have the handouts, etc ready for you to down load 1 week from, for today! Education Talk Radio is one more resource available to you! Mark your calendar for Monday, Feb. 16, 9:00 a.m. ET (8:00 CT/7:00 MT/6:00 PT/5:00 AK, 4:00 HI time!) when Larry Jacobs will be interviewing me about what is going on in the world of CASE! Education Talk Radio is on the web at www.education-talkradio.org for PreK-12 and for Higher Ed at www.highereducationtalkradio.org. EduTalk radio does dedicated interviews about the world of education daily and CASE is regularly represented, as are many other professional educational associations, thought leaders, education companies and education professionals; teachers, administrators, etc... Every show is archived at their sites and the future schedule is also there. They tweet '@edutalkradio' and announce all shows there as well... Thank you. The two main speakers are long time CASE friends, Julie Weatherly, Esq. and Dr. Joanne Cashman. There will be other great speakers including Denise Lowell-Britt, Esq, Ruth Ryder, Deputy Director, OSEP; State Special Education Directors, Angela Denning (AZ) and Debbie Gay (GA) as well as others. It is critical that we get the information presented out to general education — especially principals and assistant principals — special education administrators, teachers — especial those just starting on their career ladder — as well as to community/business people and parents! 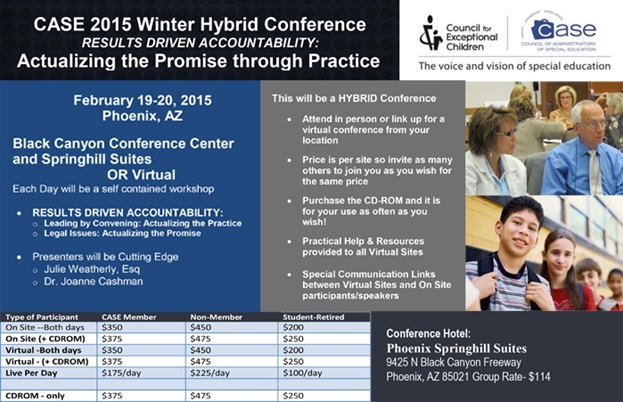 Click here for a flyer on the conference. For more information and to register, go to the CASE website or the registration website. Remember, for just $25 more on your full registration, you can have the DVD of the complete conference to use over and over and over! But, wait ... If you can't travel, why not have your own mini conference. You pay one registration fee and then have as many people as you wish to participate with you — what a really great way to connect face to face and build teams for sustainable change?! We have even made up a set of HINTS for you to use to get you started. Click here for a tentative schedule but remember this one is in Eastern Time, if you are in other time zones, change the times accordingly. We will be providing schedules by time zones on the website in the next week to make it easier for you. We will also provide a flyer for you to customize to publicize your event. As part of the CASE strategic plan, our goal is to get the best information out to the most people. Go to the CASE website for more information, or contact Will Gordillo, CASE Professional Development chair at wjgordillo@aol.com. Infographic | 5 Legal Dos and Don’ts to Avoid Due Process by Julie Weatherly, Esq. CASE Night tickets are selling like hotcakes! On Jan. 29 from 3:00-4:15 p.m. ET, the National Center on Intensive Intervention in collaboration with the National Center on Systemic Improvement will host a free webinar, Making Fractions Make Sense: Considerations for Secondary and Intensive Intervention. This webinar presented by Drs. Russell Gersten, Sarah Powell and Robin Finelli Schumacher, will discuss the importance of fractions instruction and typical challenges faced by students, share recommendations for fractions instruction, and provide considerations for supporting students within secondary or Tier 2 and intensive intervention. Content for this webinar will draw on the Institute of Education Sciences practice guide, Developing Effective Fractions Instruction for K-8, research on Tier 2 fractions instruction from the IES funded Center for Improving Learning of Fractions, and the National Center on Intensive Intervention's data-based individualization approach. Click here to register for the upcoming webinar. If you are unable to attend the live event, an archived version of the webinar will be posted on our website following the event. Proposals are now being accepted for the 20th Annual Conference on Advancing School Mental Health to be held Nov. 5-7 at the Sheraton New Orleans Hotel in New Orleans, Louisiana. The theme of the conference is Getting Jazzed about School Mental Health — Celebrating 20 Years of Advancing School Mental Health. The annual conference will offer attendees numerous opportunities to advance knowledge and skills related to school mental health practice, research, training and policy. The conference emphasizes a shared school-family-community agenda to bring high quality and evidence-based mental health promotion, prevention, and intervention to students and families. The intended audience for the conference includes clinicians, educators, administrators, youth and family members, researchers, primary care providers, advocates and other youth-serving professionals. The deadline for submissions is Feb. 20 — all proposals must be submitted online, https://cf.umaryland.edu/csmha/. The conference is hosted by the Center for School Mental Health and the IDEA Partnership (funded by the Office of Special Education Programs, sponsored by the National Association of State Directors of Special Education). On Feb, 26-28 the 33rd annual Midwest Symposium for Leadership in Behavior Disorders will be held at the Sheraton Crown Center, in Kansas City, MO. The keynote will be Dr. John W. Maag who will speak on "Resistance to change: Overcoming limitations toward addressing student's challenging behaviors." There will also be 45 other workshops and session on topics including: Tantrums and meltdowns; Escape and avoidance behavior; Trauma informed intervention; Preschool for young children with behavioral needs; Culture, behavior and disproportionality; Violence against teachers; bullying prevention and intervention; Legal issues related to behavior; and many others. Detailed information and registration is available at: www.mslbd.org. It's that time of year again! The Division for Learning Disabilities is recruiting nominees for the Jeannette E. Fleischner Career Leadership Award and for the Outstanding Educator of the Year award. Please see below for descriptions of each award and note that both include a travel stipend to help ensure the winners can attend the DLD business meeting at CEC to receive their award in person. We have extended the deadline for these nominations to Feb. 10. The Jeannette E. Fleischner Career Leadership Award honors those who have advanced the field of learning disabilities through direct services, policy development, community service, research or organizational leadership throughout their career. Up to three awards may be given annually to recognize a variety of contributions. The award consists of (a) a $500 stipend, (b) up to $500 in travel expenses for presentation of the award at the DLD business meeting held during CEC's annual convention, and (c) a commemorative plaque. Nominations for this award are due 25 January annually. Extended to Feb. 10. Outstanding Educator-of-the-Year Awards are designed to recognize outstanding professionals who serve students with learning disabilities. Nominees may be special educators, general educators, administrators, or other educators who have spent at least 5 years serving students with learning disabilities at any grade level. The award consists of, (a) a $200 stipend, (b) up to $500 in travel expenses for presentation of the award at the DLD business meeting, held during CEC's annual convention, and (c) a commemorative plaque. Nominations are due 25 January annually. Extended to Feb. 10. Please visit http://teachingld.org/awards to download the application and feel free to contact Dr. Rebecca Zumeta (rzumeta@air.org) if you have any questions. Recently, that includes key investments to expand high quality early learning programs, increase equity and opportunity for all students, support teachers, and improve access, affordability and student outcomes in College. The budget request is $70.7 billion in discretionary appropriations for the Education Department, a 5.4 percent increase over FY 2015. The National Summer Learning Association is seeking application for their Excellence in Summer Learning Award and The Founder's Award which recognize outstanding summer programs or models that demonstrate excellence in accelerating academic achievement and promoting healthy development for young people between pre-kindergarten and twelfth grade. A commonly used pesticide may alter the development of the brain's dopamine system — responsible for emotional expression and cognitive function — and increase the risk of attention deficit hyperactivity disorder in children, according to a new Rutgers study. The research published in the Journal of the Federation of American Societies for Experimental Biology, by Rutgers scientists and colleagues from Emory University, the University of Rochester Medical Center, and Wake Forest University discovered that mice exposed to the pyrethroid pesticide deltamethrin in utero and through lactation exhibited several features of ADHD, including dysfunctional dopamine signaling in the brain, hyperactivity, working memory, attention deficits and impulsive-like behavior. Tanya always forgets. What's wrong with her? On Friday, Tanya's teacher sighed sorrowfully, "Tanya forgot all six sight words she knew on Monday. I spent 30 solid minutes teaching them to her. This always happens. What's wrong with her?" What's wrong? Maybe nothing. Maybe she just needs the right kind of practice. So what to do? How can you increase Tanya's chances of remembering these and other words for a lifetime? One way is distributed practice, also known as spacing. Most siblings with a diagnosis of autism do not share the same genetic risk factors for the disorder and are as distinct in their behaviors as any brothers and sisters, scientists reported in a study that came as a surprise to many doctors, if not to parents. Scientists analyzed genetic material from 85 families, using a technology called whole-genome sequencing. Unlike other approaches, which illuminate a sample of a person's genetic material, the whole-genome technique maps out the entire voluminous recipe, every biological typo, every misplaced comma or transposed letter. Each of the families had two children with a diagnosis of autism. Lawmakers in Congress are renewing efforts to ensure that the federal government lives up to its promise to fully fund special education. A bill introduced Tuesday in the U.S. House of Representatives calls for Uncle Sam to increase funding for the Individuals with Disabilities Education Act incrementally. Congress committed to pay 40 percent of the cost — a level that is considered to be full funding — back when IDEA first became law in 1975, but has never lived up to that threshold and currently covers just 16 percent. States and localities are left to pick up the remainder of the tab. President Barack Obama is planning to ask lawmakers for a sizable increase for the U.S. Department of Education in his fiscal year 2016 budget request, sources say. The request, being formally unveiled on Feb. 2, includes big hikes for teacher quality, preschool development grants, civil rights enforcement, education technology, plus a new competitive-grant program aimed at helping districts make better use of their federal and local K-12 dollars. Young children with disabilities at New York City charter schools were more likely to stay put than their peers at nearby traditional schools, according to a report released Thursday. The Independent Budget Office said that using a broad definition of special needs, 53 percent of kindergartners with disabilities remained in the same charter school four years later. In traditional public schools in the same communities, that rate was 49 percent. Critics say that charters often push out special-needs students to improve performance data, a charge that charter advocates deny. The report found, however, that the charter group started with a lower share of kindergartners with special needs — 8.9 percent compared with 12.7 percent in the traditional public schools. Will digital accessible books improve reading for students with dyslexia? In second grade, Jose Alvarez struggled to read. He had fallen behind early in school. His older brothers and mother are dyslexic, and the family feared that Jose might have a learning disability too. Shortly after attending a third grade class taught by Ann Henkels, a dyslexia teacher in Frisco Independent School District in Texas, Jose's reading abilities began to improve. His teacher had given him a reading assignment with an accessible book that he read on an iPad. Jose’s reading ability went from a second grade level to a fifth grade level. His mom credits Henkels, his teacher and accessible books for the joy her nine-year-old now experiences in the learning process. A federal complaint filed yesterday argues that Columbus and five other central Ohio school districts are among those that discriminate against special education students whose parents speak Spanish by failing to provide translation and interpreters. Disability Rights Ohio, a federally designated advocate for people with disabilities in Ohio, and Toledo-based Advocates for Basic Legal Equality say that the following districts have shut families out of the special-education process and should be forced to make changes immediately: Columbus, Dublin, Groveport Madison, South-Western, Toledo, Westerville and Whitehall. In many schools, psychologists have time for little more than assessing students. That prevents them from using their range of skills in counseling, data analysis and preventing bullying, suicide and violence. As the number of psychologists shrinks in many districts, the priority becomes compliance with federal special education laws, leaning away from providing services that are not legally mandated but that help the general population of students. The idea of personalized learning is seductive — it implies moving away from the industrialized form of education that pumps out cookie-cutter students with the same knowledge and skills. After decades of this approach, it is clear that all children don't learn the same way and personalization seems to honor those differences. However, that term has taken on several different meanings. Fourth- and fifth-graders who did mindfulness exercises had 15 percent better math scores than their peers. In adults, mindfulness has been shown to have all kinds of amazing effects throughout the body: it can combat stress, protect your heart, shorten migraines and possibly even extend life. But a new trial published in the journal Developmental Psychology suggests that the effects are also powerful in kids as young as 9 — so much so that improving mindfulness showed to improve everything from social skills to math scores. The following Notice of Applications for New Awards; Training and Information for Parents of Children with Disabilities — Parent Training and Information Centers was published in the Federal Register on Thursday, Dec. 11. Notice inviting applications for new awards for fiscal year (FY) 2015. Catalog of Federal Domestic Assistance (CFDA) Number: 84.328M. Deadline for Transmittal of Applications: Feb. 9. The following Notice of Applications for New Awards; State Personnel Development Grants (SPDG) Program was published in the Federal Register on Monday, December 15, 2014. Notice inviting applications for new awards for fiscal year (FY) 2015. Catalog of Federal Domestic Assistance (CFDA) Number: 84.323A. Deadline for Transmittal of Applications: Jan. 29. State Personnel Development Grants (SPDG) Program was published in the Federal Register on Friday, January 16, 2015. Applications for New Awards; extension of the application period. Federal Domestic Assistance (CFDA) Number: 84.323A. On Dec. 15, 2014, we published in the Federal Register a notice inviting applications for new awards under the SPDG competition. That notice established a Jan. 29 deadline for the submission of applications, and a deadline of March 30 for intergovernmental review. We are extending both deadlines by fifteen (15) days. Dates: Applications Available: Dec. 15, 2014. Deadline for Transmittal of Applications: Feb. 13.